Dulcie Stewart. Fijian in Brisbane. 2011 [detail]. Dulcie Stewart grew up in Fiji of complex Fijian, British, European, and Chinese heritage. She was identified as either Part European, kailoma meaning half caste or literally belonging in the middle, or a general voter, that is ethnically unreconciled. It was only in coming to live in Australia that she became known as Fijian. In this work, Fijian in Brisbane, she contextualizes the narratives of her Fijian/white/Asian mixed heritage against forced labels and identity; it is a visual interpretation of personal narratives. The digital image explore questions of identity, both her own and that of others, connecting to Fiji and being Fijian in Australia. Dulcie Stewart. Fijian in Brisbane. 2011. Fijian tapa, manhole, Hipstamatic iPhone app. Drawing from her i see oceania photo blog, where she documented Pacific motifs in her urban environment, Dulcie sees patterns of the Pacific in her everyday life and urban landscape. Using Fijian tapa (bark cloth), she outlines the geometric lines on a manhole which has Brisbane written on it. When repeated, the image shows a repetition of geometric shapes and lines which pays homage to Fijian tapa motifs and patterns on a woven pandanas mat. General voter – the voting system in Fiji (pre-coup d’état 2006) was based on ethnicity. You voted according to race, either as an indigenous Fijian or Indo-Fijian. The ‘others’ were bunched together as General Voters. This included ethnic minorities, such as Europeans, Chinese, Banaban Islanders, as well as multiracial people. Fijian in Brisbane was part of diasporadic679, a public exhibition of Fiji artists living in diaspora. Timed to acknowledge Fiji Independence Day and pay homage to the Fiji telephone prefix, +679, the artists reflected on Fiji Islander identity and diaspora experience from seven diverse positions. 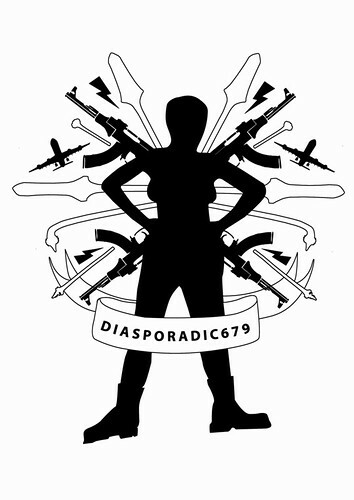 diasporadic679 was part of the 2011 Southside Arts Festival.